Arthur: One thing you’ve talked about recently is the parallel between contemporary America and Weimar-era Berlin and how you never understood how artists and intellectuals could be quiet. Now you sort of understand? 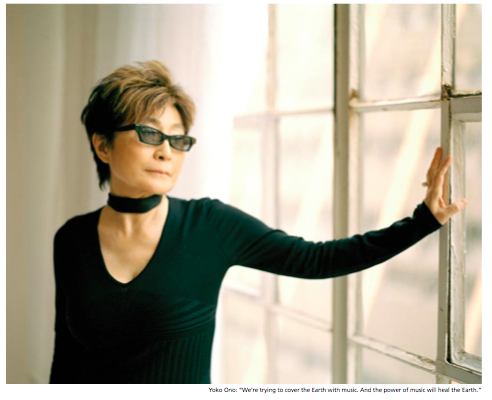 Yoko Ono: Yes, now I understand because we’re quiet. We’re sort of tired of this, you know. I mean, each one of us is trying to do something, but it’s not that effective. It’s not going to change the course of things. They’ve just announced that they are going to keep on increasing warfare no matter what. Arthur: Do you think it’s possible to affect some kind of change? Ono: I definitely think so. I think many things are on a very different level, actually. Everything that’s happening now is so incredible. There was an experiment that was done with a paraplegic guy who lost both hands and both legs and with a computer he drew a circle. Just with the mind. Now that’s very interesting, isn’t it? But it’s not a front-page article. The things that we were saying, that we can do it with visualizing, with your mind, is what he did. Also, and I don’t know if this is true or not, but at Princeton, the latest experiment that they did was to make a mattress move by will. When a guy does it, it moves. And when a woman does it, sometimes it goes into reverse. Like when you say, “go right,” it goes left. Interesting. But when two people do it together, as a couple, it’s more effective. And, I choked up when I heard this last one, which is that when two people who are in love try it, it’s the most effective. These experiments are ready now to be done now with stem cells or DNA. We have everything we can use in front of us. Arthur: So do you think that if everybody who’s in love would think about George Bush leaving the Earth NOW he would rise up in the air? Ono: No, but this is what the problem is. All of us are 80 per cent water or maybe more. So when I say to you, “I hate you,” I might be saying it with a laugh, but the water takes it seriously. So your water is saying, “Omigosh, she hates me.” I say, “I love you,” you get it. But at the same time I’m water too. So I’m saying to myself that two people may be in love, God they must be in love because they look beautiful. Well of course, because each time they see each other they say, “I love you, I love you.” But actually they are saying it to themselves, too. They don’t know they are saying it to themselves. You see those people who hate and talk about, “Kill, I’m gonna kill…” They’re not just killing someone. They’re killing themselves. So you see that in their faces. And when people say, “How are we going to change the course of things?” and, “Can we destroy them?” I say “no.” If anything happens, the castle falls within. We’re not helping; we keep putting our energy, our focus on them. We shouldn’t do that; we should just create our own beautiful world. And if they’re going to join, that’s fine. We’re not doing that. There are two industries in the world. One is the war industry and the other is the peace industry. The war industry people are very much together. They are so united they don’t even have to talk to each other. They know they want to kill and make money. But the peace industry people are such idealists and perfectionists. We’re arguing ourselves to death. “The way you’re doing it is not right.” If we can become more gentle and generous to each other, if we can love each other instead of commenting, criticizing each other then we can get together and we’ll be a good force. And our force has to be just as strong as the war industry people or more. And when I say “force,” it has to be viable as well because the economy is controlling the world. Of course the war industry is much more viable than the peace industry. But it’s getting there, in a sense. In so many countries, people are opening up to appreciating art or music. And that’s going to do it. I’m doing that and I’m sure you are too. We’re trying to cover the Earth with music. And the power of music will heal the Earth. And we should concentrate on that rather than saying, “What are we going to do with that guy?” We don’t want to know about that. Arthur: I guess the ONOCHORD project figures specifically into that. That’s part of the peace industry? Ono: Yes. Yes, I’m doing that. But you know, people are always saying, “It’s slow going, it’s slow going.” But it’s not, you know; things have their own time. Some things happen so quickly, like if you can change the social climate. It’s like a fashion show. First, they are wearing the chapeaux, now everybody’s wearing them. When I was in London recently and I went to my son’s concert. Afterwards they said, “You can’t go out now, there’re so many people standing out there.” Well, I just went out and FLASH FLASH FLASH and my people got scared. “Quickly! Go into the car!” And I just looked at the crowd and they all had ONOCHORD flashlights going 1-2-3. It was so beautiful. And I didn’t tell them to do it. It’s just catching on a bit. Arthur: Where did you originally get the idea for that? It’s kind of an instructional art piece. Ono: I’ve been doing instructional art pieces for the longest time. But ONOCHORD started around 1999 when I first started thinking about that. There’s another I did called Wish Tree. It sounds like a very, very dumb idea. I’m asking people to write their wishes and put it on the tree. And this is like my hit idea. People who’ve never been to a museum, they were queuing to go that museum to hang their wishes on the trees. Most places where I do this they have to add trees because there are so many wishes. Arthur: When did you really start doing instructional art? Arthur: So it was really after you moved to the States and you were at Sarah Lawrence. Arthur: We were curious if you had done any stuff like that back in Japan before you came to New York. Ono: I was doing that not as an artwork but as poems. There were one-liners and all that, Japanese haiku style. I was doing that in high school. Arthur: Was there anyone at Sarah Lawrence that you connected with that led you into the avant-garde? Ono: Sarah Lawrence is a very free-thinking place. But people there were very academic as well. Arthur: Were you studying art there at that time? Ono: No, I was studying musical composition and philosophy and writing literature. Arthur: Did you choose Sarah Lawrence because of their curriculum? Ono: That’s what it was, but also it was near where my parents were living in Scarsdale. But also, I have to go back to this music thing, because when I was about four years old I was in a Japanese school called Judaku, which means Three Gardens. And there they teach children perfect pitch and harmony and all that kind of thing when they are very young. And my mother sent me there. Many famous composers from Japan graduated from there. The strange thing was the homework. One day the homework was to listen to all the sounds in the city that day. And transpose that into musical notes. And so you would listen to noise and transpose it. That’s pretty good for the 1930s! That’s the kind of exercise we were doing. So that’s where I started. And my father told me that there were no famous women composers and it’s probably easier for women to go into singing other people’s songs, playing other people’s songs. Interpretation. But I wanted to be a composer. He said that’s a very good thing to be. He meant well, of course. Arthur: The first piece you wrote then was “Secret Piece”? Ono: That was the first piece that was publicly shown. That was an instruction piece. At Sarah Lawrence I was writing things that were more like 12 tone compositions. But you have to go somewhere. You don’t want to be just writing like Schubert or Beethoven. My feeling was that if you can’t do something new, don’t do it. That was my way of thinking .It was so difficult to write that way. [laughs] But I loved the fact that they would change their rhythm and notation every bar, it’s beautiful. I did get influenced by that. Also the other very interesting influence was…when I was a very young child, my mother used to say. “Don’t ever go to that end of the house where the servants are, because they are talking about some things that you should not know about.” So, of course, I was interested. So I would sneak down there and listen at the window. One day I was listening and I heard these two girls talking about the fact that their aunt or somebody had a baby. And one of them started making the sound “HUHH! HUHH!” And I never forgot that. The first thing I did was I started doing it with my breath, “HOOOOHHH!” And I thought well I’m using my voice as an instrument. And then it happened where I was to do a Carnegie Recital Hall performance in 1961. Before that I was using my voice in a tape recorder, a Nagra. I was doing some great stuff but I didn’t own a tape recorder yet, so I went uptown somewhere in New York where somebody had told me that some guy had a tape recorder that I could use. I went and did this long thing and I asked if I could copy it and have it. He said, sure, that would be fine. But I don’t have it. I don’t remember the guy, but I would hope he still has it. Anyway, two nights before the recital I was recording this thing on the Nagra. And just by mistake it went into reverse. And the thing was I was going, “AAH UHHH AAHH!! !” or something like that. Then it went in reverse and it was “UHWAAH HHUUUHWUUH!! !” and I thought—this is much better, I’ll put that in the concert too. So in the tiny recital hall concert I had this very interesting thing that I did. Arthur: Did you perform with tapes? Ono: I performed with a tape and also without. The show was so incredibly far out. I got somebody to control the tape recorder and I asked him to keep on taping the sounds. So It would be going, “AAHHH BBBUUHH BBUHH AAAH!! !” and he would tape that, but then the next one that I do should be taped on top of that so it would keep accumulating into a big sound. Arthur: Was that material notated at all? Ono: No, it wasn’t notated. I started to believe in the sound of that moment. From a very young age I used to read these Chinese stories about all the battles that they had to acquire the center. There were many, many high mountains with a field in the center. And whoever conquered the center field was the emperor. Then they would become very soft. And then the monks would come down and destroy them. I was fascinated by reading these. I thought I was a warrior. A warrior with one sword, which was just my voice. I could go anywhere. I felt if you wanted me to do something with you, then let’s do it. And I’ll do it with my voice. That’s how I was when I arrived places. And when I met John. Arthur: When was it when you started going into New York? When you were at Sarah Lawrence would you go into to see concerts? Ono: Yeah, I did, yeah. But there weren’t many concerts that I enjoyed so much. Arthur: Were you going to see jazz at all? Ono: I listened to jazz too, yeah. I wasn’t that interested. I was trying to create a new sound. The reason you create a new sound is because you’re not that interested in the sounds that are around you. Arthur: When you were doing this was there much enthusiasm for you anywhere? Ono: No. I knew who I was; I had the world in my hand. I could care less who knows about it and who doesn’t. It was like I was doing it, you know, and the Carnegie Recital Hall was a full house, which was nice. But the reviews were not very good. The kind of thing I was doing in my head was not expressed clearly, maybe; but I was not known. Arthur: When you first moved to New York was the Chambers Street loft the first place you lived? Ono: No, I was living in an apartment on Amsterdam Avenue with Toshi Ichiyanagi. We were just walking around and there was this ballet studio and I said to Toshi, “That’s the kind of place we should get. So all of our musician friends can do something there.” Because at the time there was only Town Hall, Carnegie Recital Hall and Carnegie Hall. Only three places for concerts. And you can’t get into Carnegie Hall or Town Hall; you can only get into Carnegie Recital Hall. Arthur: So Judson wasn’t happening? Ono: Judson was mostly dance. Al Carmine is a very, very important person, but Judson was basically showing “actions.” But Carnegie Recital Hall—people like John Cage, Edgar Varese and Henry Cowell, that class of people, only got in just maybe once. And Stefan Wolpe, he was a very good friend of mine. I met John Cage, actually, through Stefan Wolpe. I went to a concert they were doing which was Stefan Wolpe, Edgar Varese and John Cage. Ono: Before the concert we met at the Russian Tea Room and Stefan said, “Oh, I’m going to introduce you to John Cage.” And John was there with David Tudor. We talked about finding a different place to play. So I went to look at this studio on 94th street, but it was very, very expensive. Does this interest you? Arthur: Oh yeah, yeah! This is great! It’s exactly what we want to hear! The more the merrier! Ono: So anyway, Ino Miyuzami, a sculptor, knew that I was looking for a place. So he said, “These days artists are working in a couple of lofts.” And we didn’t know what lofts were. We found out they were warehouse spaces that were not being used and they were cheap. So some artists were doing that. And in those days you could not stay in a loft, it was illegal. And he said, “One Sunday let’s go there and I’ll show you some lofts there.” So he took me downtown and we went to Chambers Street because he knew of one there. So I went there and they said, there was this very famous Japanese woman painter who came and saw it and she may take it. “But if she doesn’t take it then you’ll have it.” It was 50 dollars and 50 cents a month. Chambers Street was really the middle of nowhere then. That was such an old neighborhood then. The buildings were from the Dutch era. So I went home to Amsterdam Avenue. It was a second floor apartment above a liquor store. I’m rolling on the bed, moaning and saying, “I’m not going to get it, I can’t get it!” And Toshi was saying, “Stop it, don’t worry about it. So you don’t get it, so what?” So the next morning I got cash, and it was very hard for me to get cash for 50 dollars. Actually, 25 dollars, because they said an advance of 25 dollars is fine. So I grabbed 25 dollars and I ran. In those days I could walk from 125th Street to Washington Square. It was nothing. So I got to Chambers Street and I said, “What happened?” And they said, “Oh, she didn’t take it.” And I said, “OK here’s 25 dollars.” And I got it! And that was the loft where I took a piano in there, an old piano that I bought. And that was where the first loft concert was in New York. The first concert was in December 1960. It was snowing and people from Stony Point, which was David Tudor, John Cage and Merce Cunningham, those people came down. They were the first ones. Bundled up, because it was a cold water flat. Arthur: All those places had no heat at night, just during the day. Who performed that first night? Ono: I forgot. But there’s a whole history that George Maciunas documented. Arthur: Had you met George at this point? Ono: No. And then the loft concerts became very, very successful. Arthur: How often did you do them? Ono: Once a month. One day somebody called me, and I’m not telling you who that was, and said, “You’re finished, you know, because all your artists are now going to go to Maciunas who has a midtown gallery. Because he came to your show and he liked the idea and he’s going to do the same thing with all your artists.” By then I didn’t really mind. There was so many problems. You know when something is successful it’s a lot of problems with ego games and everything going around. And then I got a call from George Maciunas and he said he wants to do my art show. And that was my first art show. Arthur: Yeah right, the AG Gallery. Ono: It worked out very well for me. Arthur: You were doing visual art all through that time as well? Arthur: The show then, was that a combination of visual art, music and instructional art? Ono: No, just visual art. Arthur: So they were like the early Flux objects? Ono: No, it was instructional paintings. It was very original, I think, for me to do it that way. Each painting having instructions. I can count the people who came there, that’s how few people there were. It was during the summer. By 1966 I was really there, working in New York and the same people were coming to see my work and I thought there was something wrong about this. So I started wandering off and in 1966 I went to London. Arthur: To the Destruction In Art symposium. What drew you to London, was it just the unrest you were feeling in New York? Ono: No, no, no. Unrest yes, but I’m not one of those people who says, “Well I’m just leaving.” It didn’t work out that way. I was invited. And my marriage was going very badly and I felt like I had to leave. Arthur: You spent some time back in Japan before that. The Japanese avant garde probably had changed since you had been there previously. Gutai came along. Ono: You know it’s funny, I didn’t really even know about Gutai. I went to Claes Oldenburg’s happening at his store and someone asked me if I knew about Gutai and I said, “No.” And they said, “Well you better look into it, because they did this before Fluxus, you know.” But I was sort of lazy and I didn’t really look into it. Now that I think about it, Japan was really far out. Arthur: Yeah, I mean there were a lot of things that were sort of spinning around. It seemed like finally the post-Second World War thing had gotten shaken off to enough of a degree that people were starting to embrace their own culture. Did you feel like there was an avant-garde community when you went back there? Ono: I noticed it when I went back there in 1962 and I did a big event and I saw all these avant garde artists there, and they were pretty violent. Arthur: That must’ve been when you working on the Grapefruit book. Ono: Yeah, exactly. The first people to really do things there were Gutai. Arthur: The last thing we’ll ask you, to jump ahead to your London sojourn, with your show at Indica, which was extremely significant, is about the track you recorded called Cambridge 69 at the Mitchell Hall in Cambridge. Ono: Ha ha, what about that? Arthur: Well the fact that it was recorded with John Tchicai, the Dutch saxophone player and John Stevens, the British drummer. How did you hook up with those guys? Ono: I didn’t know them, I didn’t know anything about them. What happened was, Cambridge asked me to come and do a lecture or whatever. I had few invitations from different places like Vienna asking if I wanted to make a film, any film would be OK. I showed this to John and John said, “You better make it then.” And I showed him the letter from Cambridge and he said, “OK, you better go. And you better call.” So I called and I said, “Hello, yes I will be coming.” And John said, “Say you’ll bring a band.” “Yes and I’m going to bring a band.” And John said, “I’m the band.” He said, “You don’t need anyone else, I’m gonna be the band.” And he was very excited about it. So John and I went there and we just walked through, “Hi, hi,” you know. And they all looked at us and I think they hated it actually. They were academic people and we were dressed like rockers. I just started my thing and John Tchicai and these people just came in and improvised. We didn’t know. Arthur: You don’t know who invited them? Ono: I have no idea. Arthur: The track is amazing. It’s one of the first full-on feedback guitar tracks. Ono: I think John was really an amazing guy. He had all that in him and he couldn’t put it down on a Beatles record. He really cherished the fact that we were doing something experimental. He was very proud of it. ← JUST LIKE IRAQ: Bush Administration keeps contriving rationales for attacking Iran.